Description Scanned as B & W. Blue ink numbers on front of photo. Accompanying note: Front row: Wanda Davidson; __;__; Gordon Bruce; __ Larson; __, Eunice Weidman; __; __; second row: __ Fox, Ava Bickner; Price Burlingame; Constance Koehler; Ernest,Norman,Prentice? Baker, Roma Confer, Josie Pollard, __, __. 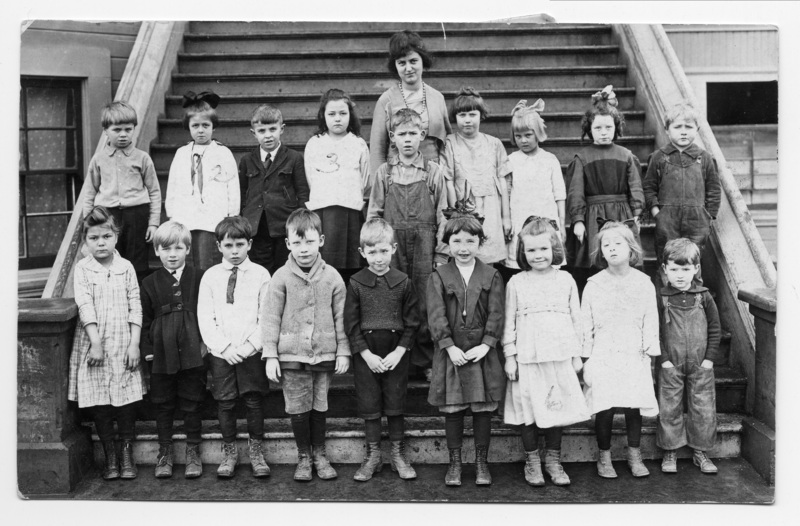 Shannon Pettinger-teacher; probably 1919. Same as 356b. Physical Description 3 1/2" x L 5 1/2"